Are foreclosures going the way of the dodo? Not quite, but they certainly aren’t as common as they once were, if a new report from DataQuick is any judge. The company, which tracks home purchases nationally and in many large metros across the country, noted that foreclosures accounted for just 16.3% of the Southland resale market in October. While still a sizable chunk of home sales in the hard-hit area, it’s nowhere close to the 32.8% share seen a year earlier. In fact, last month’s level was the lowest since October 2007, just after the housing boom went bust. The highest monthly percentage total recorded was a staggering 56.7%, seen back in February 2009. The word “yikes” comes to mind. Yes, more than one in every two resales used to be a foreclosure in SoCal, which explains the rapid decline in home prices. But now that foreclosures are becoming less and less common, home prices are marching higher, and are now at levels not seen since August 2008. We’ve still got a long way to go to hit those insane 2006 and 2007 numbers, but things appear to be on the mend. Even home flipping is up, rising from 3.7% last year to 6.1% last month. Watch out for bad granite countertops, laminate floors, and cheesy fixtures. The median price paid for a home in the Southland last month was $315,000, steady compared to September, but up 16.7% from October 2011. DataQuick attributed the rise to highly favorable mortgage rates, along with a change in the mix of homes selling. In short, heavily discounted foreclosures are being replaced by a larger share of move-up home sales, which pushes the median higher. Home sales in the $300,000 to $800,000 range have jumped 41.5% annually, while sales above $500,000 are up 55.2%. 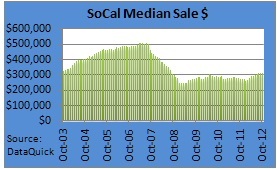 And last month, home sales over $500,000 accounted for 23.3% of all SoCal sales, up from 17.9% a year ago. Overall, it’s still not very pretty. Short sales still hold more than a quarter of the resale market (26%), down slightly from 25.4% a year ago. The good news is that investors seem to be on-board, despite the rise in home prices. Absentee buyers, which purchase both investment properties and second homes, bought 28% of Southland homes in October. That number is up from 27.7% in September and 25.4% in October 2011. The record was set earlier this year when absentee buyers snatched up 29.9% of sales in February. Seeing that the monthly average is 17.6% going back to the year 2000, there are clearly some deals to be had out there still. Unfortunately, for everyday homebuyers, the investors are making it increasingly difficult to snag a property on the cheap, or at all for that matter. About a third of all purchases in October were paid for with greenbacks (32.1%), up from 30% last year, and not far from the record of 33.7% set in February of this year. Cash offers easily trump those looking to finance a deal with a mortgage, which explains why buyers are having to come in with sizable down payments if they want to be considered. It’s clear if you look at the FHA loan numbers – last month, they accounted for just 25.2% of all purchase mortgages, down from 31.9% a year ago. The FHA-share is now at its lowest point since July 2008, because let’s face it; a 3.5% down payment doesn’t beat a 100% down payment. Put simply, if you want a house in a desirable area, be prepared for a bidding war.